Members of Boy Scout Troop 33 enjoyed a backpacking adventure in the back country wilderness of Black River State Forest in Wisconsin. Pictured (from left) are Tom Comer, Matthew West, Ryan McNett, Bryce Comer, Aiden Witthoff, Caeden Keith and Chad McNett. 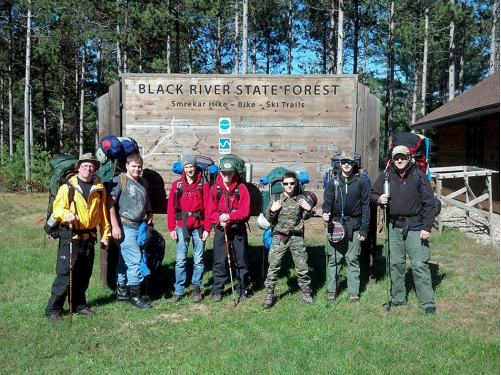 Boy Scouts from Troop 33 in DeKalb enjoyed a backpacking trip at the Black River State Forest in Wisconsin. Scouts carried food, water, bedding, tents, clothing, plus cooking utensils and stoves on their backs. When backpacking in remote areas, scouts have to prepare for potential dangers and difficulties like adverse weather, treacherous terrain, health risk or injuries or dangerous animals. The Scouts felt trained and ready. A few climbs brought them to high points with amazing views where scouts could look for miles in all directions. It gave them a sense of achievement and an appreciation for the beauty the wilderness provides. Scouts spent time each day working on cooking skills and sharing their talents. At night they talked, laughed and shared stories around the campfire. They practiced “leave no trace,” a low-impact outdoor ethic that promotes conservation in the outdoors. They learned to better appreciate the outdoors while they had fun, strengthened bonds, and shared positive experiences.